While speaking at the D9 conference yesterday, Ralph de la Vega, president and CEO of AT&T, revealed that the carrier is not that far away from launching a shared mobile data plan. Details may be scarce at this time with prices and data caps still anybody's guess, but the advantage of being able to share your data allowance between several devices is more than obvious. Lets say that you own a tablet and a smartphone, for example. Signing up for a shared data plan will allow you to pay a single monthly data fee and to use your megabytes on whichever device you prefer. Sharing the same data allowance with your loved ones via a family plan sounds like another great way of saving on data expenses. We have heard talks about shared data plans before, but it is great to hear that they are closer than ever to becoming a reality. However, will they really make data more affordable or will just trick people into paying more for wireless broadband? We will find out as soon as all details are announced. I hope this becomes reality. Me and my wife are with AT&T and both have the 2gb data plans. She barely uses 500mb per month while I struggle to stay under 2gb. This would be great for us if it happens and if the price isn't too ridiculous. Prediction: this will be TERRIBLE for consumers. 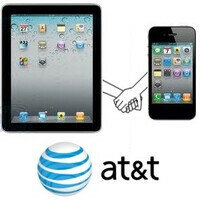 First off, AT&T is evil and whenever they devise a new plan, it ends up hurting its customers. Here's how I see this one playing out. LTE becomes fairly ubiquitous in the next five years. While this is happening, people will become anxious to ditch their cable or dsl subscriptions (Comcast might be the only tech company more evil than AT&T); they would prefer to have fast internet all the time, from one provider, never worrying about modems, routers, wi-fi, or multiple bills again. Just grab your phone and/or iPad (or whatever), and go: so convenient! But, since AT&T will ultimately be WAY ahead of Verizon in terms of HSPA+ as a back-up, they will be the dominant player in this space (especially if their assimilation of T-Mobile succeeds, which it will). So, we will have a de facto monopoly, possibly challenged by Verizon after they buy Sprint in order to play catch-up. Anyone wishing to send or receive e-mail, make or receive a call, read a book, listen to music, or watch a movie or tv show, will be relying on one or two of these giants. Yes, it will be fast and convenient, but it will be EXPENSIVE, and, as the economy continues to crumble, people will be forced to opt out of the internet all together (internet cafes will probably make a comeback for a time), so prices will keep climbing until only the rich have access to the internet, and Fox News controls all information. Probably around 2025-2030, about the same time gas hits $25 per gallon. Not even joking. I can only see this happening if it's something that’s affordable. It makes sense to pay for data only one time a month and share it then multiple times a month, depending on how many devices you have. If I am at home then I will use my tablet more. If I am out then I will use my phone, because I don't want to carrying a Tablet & a phone at the same time. Let’s say I am in the office, I will use another tablet there instead of my phone. If it's a reasonable price to share the data, I will maybe buy multiple Tablets that way I have one at home & work so it eliminates the need to carry one all the time. Heck is I am ever out with my Tablet on that rare occasion then I can still use my data. So this has some potential, BUT only under the right circumstances! It’s easy for these GIANT companies to turn a blind eye to price. I hope they have reasonable prices. I pay $109.99 a month for unlimited everything on Sprint before taxes, fee, surcharges etc. I would be fine with an increase to maybe $129.99 to have the ability to share my data across multiple devices. That seems fair, if not then Wi-Fi is still the way to go for me! I hate ATT, but this is a good idea for those who don't use a lot of data or who have wifi access. I just hope they don't screw it up. Then maybe VZW will follow their lead. First off, AT&T is evil- they're gonna find a way to screw the consumer. Second- the savings might not even be that much. Third- We're already paying for something we ALREADY have! They're scamming us and everyone should write their Congressman/woman to let them know that we are paying twice for something we ALREADY are paying for to begin with! if you don't like paying for cell phone service then cancel the service, remember cell phone's are a luxury not a necessity!